George W. Cameron died today at his home, 5 Williams Street, after a brief illness. He was born in England and came to this country 46 years ago and for the past 40 years was employed as a boss finisher in the paper mills of the city. He leaves besides a widow, his mother, Mrs. Ann Cameron, three sisters, Mrs. Fred Oatley of Springfield, Mrs. William Chalou and Miss Ann Cameron of Holyoke, three brothers, Angus of Greenfield, Archibald of West Springfield, and Malcolm of Holyoke. The funeral will be held Sunday with burial in the Forestdale Cemetery. 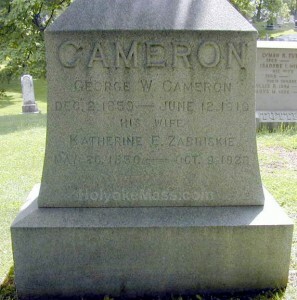 Mrs. Katherine Cameron, widow of George Cameron, died this morning at the home 111 Nonotuck Street. She was born in Paterson, New Jersey and came to Holyoke 40 years ago. She leaves a sister-in-law, Mrs. Anne Zabriski of Paterson, New Jersey, and several nephews and nieces, all of Paterson. The funeral will be held at the Alger funeral parlors Friday afternoon. Rev. Frank Duddy officiating. Burial will be in Forestdale Cemetery.